One of the reasons I love fishing Lake Michigan is because of the chance to catch some of the largest fish available in fresh water. Many, many people have scored their biggest fish ever on the Brother Nature. A few of them have taken their fish home whole, with plans to deliver it to a taxidermist to make a lasting trophy, a lasting memory of their catch. Most settle for a simple snapshot. With today’s digital cameras and cell phones, a snapshot is an easy and almost free way to remember the catch. But is it a real trophy? Getting the fish mounted is quite expensive. Measure the fish’s length, put a tape around it’s belly and add the two together. A big salmon can be 3 feet long and have a 20 inch or larger waistline. Call it 56-inches, total. Now multiply that by $10 per inch and your trophy catch can cost you way on the far side of $500. I was recently contacted by a person who offers another, way less costly option. It’s called Fototrophy. Send them a good quality photo of you and your catch. 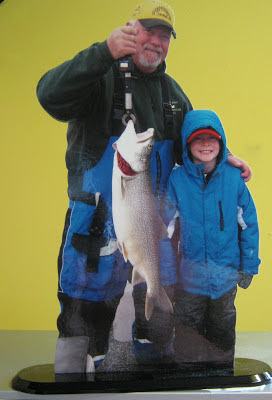 They print out the photo, securely laminate it to a thick acrylic backing, then carefully cut out the outline of you and the fish (deer, turkey or whatever). The cut-out is secured to a base plate and the result is a realistic trophy that can be displayed on a mantle, desk, bookshelf or anywhere you choose. It looks almost 3-D. The cost is reasonable. A 5-inch Fototrophy costs $40, an 8-inch is $60. Personally, the 8-incher is the way to go. Much more impressive. The photo shown here is a Fototrophy of me and a young angler who caught a lake trout almost as big as he. If you think it looks good, you should see it in person!